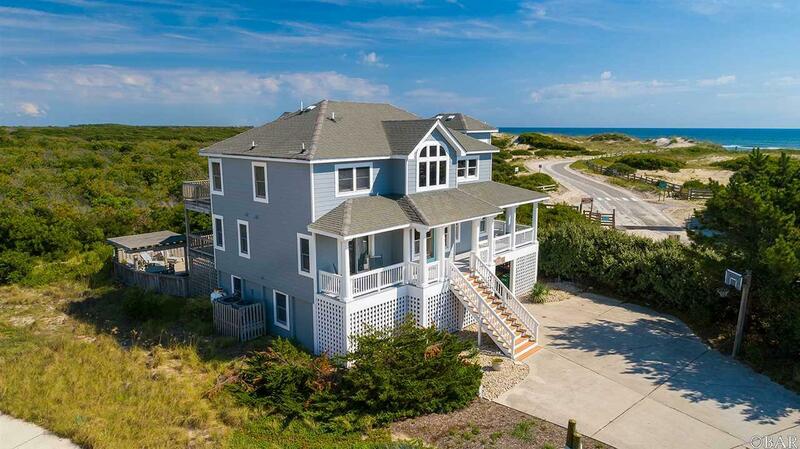 This custom-built, well-maintained home, set on an elevated lot with stunning ocean, dune, & sanctuary views, is located at the end of the paved road on a cul-de-sac in prestigious Villages at Ocean Hill. 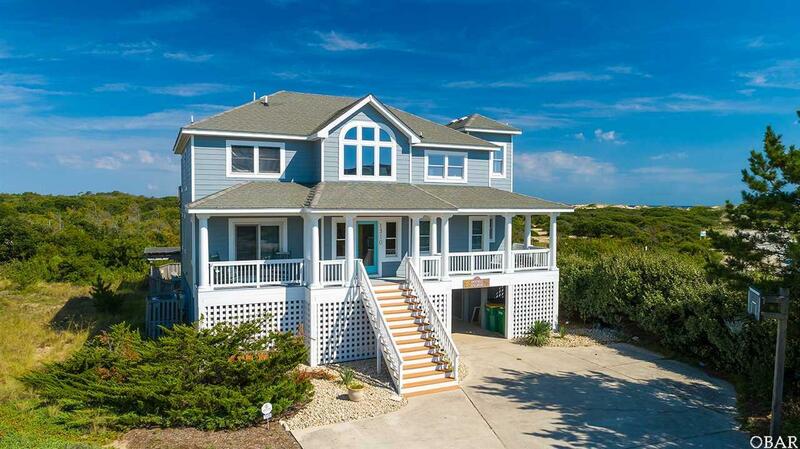 Backing up to the wildlife sanctuary, this retreat is just steps to direct beach access. On the ground level outside, a carport, large parking pad, outdoor shower, and large fenced patio w/private pool. Inside, a gameroom w/wet bar, full size refrigerator, & pool table, two bedrooms, full hall bath, and washer/dryer closet. The middle level features a tiled entry foyer, three master bedrooms, a den/sitting room, bedroom, full hall bath, and covered decks w/hot tub. On the upper level, a spacious greatroom w/vaulted ceiling, hardwood floors, gas fireplace, & windows galore for those fabulous views, dining area, elevated ship's watch, a half bath, gourmet kitchen w/granite, tile, stainless steel appliances, & island counter seating for four, a master bedroom suite w/garden whirlpool tub & walk-in shower, and ample open sun decks. 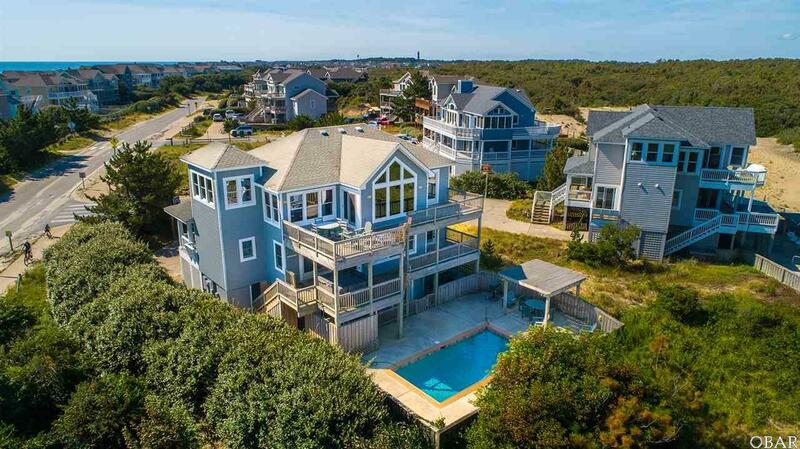 With quality craftsmanship and attention to detail throughout, this home offers the very finest in coastal living. Extensive community amenities include ocean & lakefront pools, tennis court, indoor fitness center, playground, basketball & shuffleboard courts, 8-acre lake, and pedestrian walkways throughout. 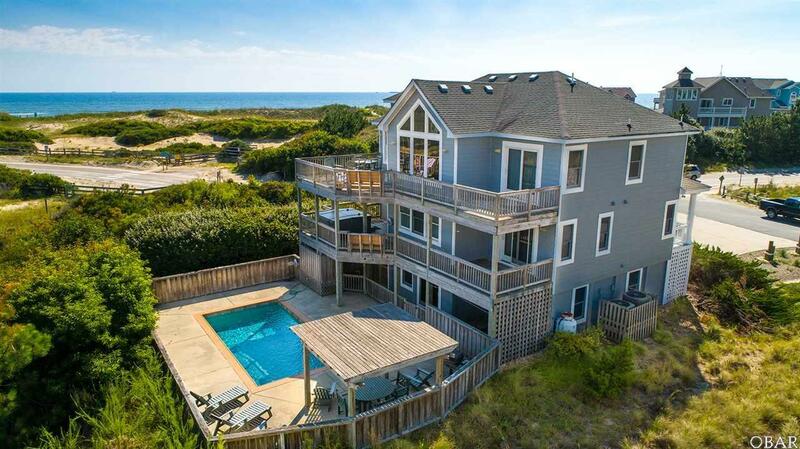 Close to shops, restaurants, 4x4 beaches, and Historic Corolla Village. Annual Rental Income 90960 Association Amenities Health ClubOcean AccessOutdoor-Comm. PoolOutdoor-Comm. TennisPlaygroundCommon Area Association Fee Includes ManagementPoolRoad MaintenanceTennis CourtsWalkways Association Fee YN Yes Bank Owned YN No Builder Olin Finch Estimated Annual Fee 1940 Financing Options CashConventional Flood Zone XCobra Full Subdivision Name Villages At Ocean Hill Possession At Closing Potential Short Sale No Primary Residence YN No Rental Cottage Name Double Anchor Rental Performance 0.1116 Residential Type Single Family - Detached Sewer Septic Municipal Sewer Tax Year 2018 Taxes 2969 Water Municipal Zoning Res.